New Delhi: The government on Tuesday told the Lok Sabha that the exposure to chemicals used in textile dyeing units can affect human health and the civic authorities would take action against any such industries operating in residential areas in the Capital. Responding to a Parliament question on illegal jeans dyeing units in the north-east Delhi’s Shiv Vihar areas, reported by the TOI in May, the Union environment minister Harsh Vardhan said, “Whenever any unit operating illegally is brought to the notice of State Pollution Control Board/Pollution Control Committees, action as per rules is required to be taken for closing of such industries”. The minister, in his written response, admitted that it does not have count of such illegal units in residential areas in the country, including inventory of such units in Delhi. He said no inventorization of jeans dyeing factories operating illegally in residential areas had been undertaken by the environment ministry or the Central Pollution Control Board (CPCB). The minister noted that the textile dyeing has been categorized as ‘Red’ category (highly polluting) industry which is required to obtain consent to establish/operate from concerned State Pollution Control Board or the Pollution Control Committee. The TOI had in May reported about discharge of carcinogenic chemicals by cloth dyeing units, highlighting how the untreated effluents are even contaminating ground water which is the main source of drinking water in the area. Responding to a question on the steps being taken by the government to check the pollution caused by dyeing factories, Harsh Vardhan said the Delhi government had directed that action would be taken by the Delhi Development Authority (DDA) and Municipal Corporation of Delhi (MCD) against industries operating in residential/non-conforming areas in violation of the Master Plan of Delhi.”In order to check pollution from dyeing industries, effluent standards for textile sectors have been notified under the provision of Environment (Protection) Act, 1986 which has prescribed standards for Chromium, Phenolic Compounds, Colour etc”, he said while admitting that the exposure to these chemicals, exceeding prescribed limit, can affect human health. 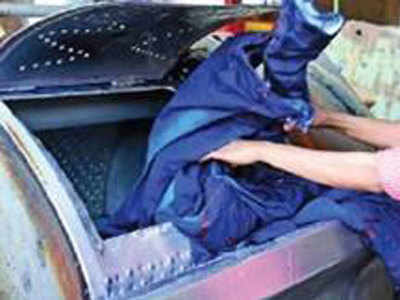 Taking suomotu cognisance of the TOI’s report, the Delhi High Court had earlier asked the CBI to probe the entire issue of the illegal jeans dyeing units and find out the complicity of officials, if any, in allowing such units in those residential areas. The CBI subsequently started its probe after registering a case on last Friday. Acting on the TOI report, even the Union water resources ministry had in May directed the city health department to conduct a detailed study on the health impact of the dyeing units operating in the Mustafabad locality of north-east Delhi and extent of ground water contamination in the area, if any, due to these industrial units. This entry was posted in Water and tagged carcinogen, Central Pollution Control Board, Chemicals, cloth dyeing, CPCB, DDA, dyeing, Environment, government, illegal dyeing, India, Jeans, jeans dyeing, MCD, Municipality, New Delhi, policy, Pollution, Pollution Control, textile dyes, Times of India, Water, water pollution. Denise Green, assistant professor of Fiber Science & Apparel Design, in front of the newly relocated natural dye garden in the courtyard between Martha Van Rensselaer Hall and the Human Ecology Building. College of Human Ecology faculty and student efforts to advance sustainable approaches to textile and fashion design has led to the development of the Cornell Natural Dye Garden after a successful crowdfunding campaign that ended in fall 2016. The project raised $10,365 for the development and cultivation of a dye garden, which will produce a variety of colors that come from the natural world and have a lower environmental impact. “We know that synthetic dyes cause incredible environmental harm and pollute waterways. Human health is also impacted, particularly for laborers in the textile dyeing industries,” said Denise Green, assistant professor of fiber science and apparel design. According to organizers, up to 200,000 tons of synthetic dyes are discharged into waterways around the globe every year, making textile dye plants the second-largest polluter of water after agriculture. In many developing nations where textiles are produced, workers may not be properly protected from the toxic chemicals used to dye fibers and fabrics, making synthetic dyes hazardous to environmental and human health, Green said. In contrast, natural dyes, some of which come from weeds, are nontoxic. Some of these dye plants have the ability to grow aggressively without herbicides or fungicides. “We believe natural dyes are an opportunity to make a sustainable intervention in the apparel supply chain,” Green said. In May 2015, Green, in collaboration with fellow fiber science and apparel design faculty and students, as well as Human Ecology Facilities Services and Cornell Botanic Gardens staff, planted a test garden of natural dye plants at the northeast corner of the Human Ecology Building overlooking Beebe Lake. “That success led us to the idea to put the garden in a place that’s more accessible for students and more visible in terms of our college life,” Green said. In spring 2016, Green and her students moved the garden to a plot located in the courtyard between Martha Van Rensselaer Hall and the Human Ecology Building. The relocation of the garden, according to Green, allows students and faculty to grow a wider array of dye plants to be used in teaching and research. “The new location is highly visible,” Green said, adding that plans are in place to add educational signage for the 2017 growing season. “Signage means that the garden won’t just be beautiful to look at, and valuable as a natural dye resource, but it will also be an opportunity to educate students, staff and the public about the plants we are growing and the range of colors they yield,” she said. Beyond working on projects, Green hopes the garden will have deep and long-lasting impacts on fiber science and apparel design students who begin careers in the manufacturing and fashion industries. “Our hope is they become conscientious citizens of the world who think about the impact that their design will have on the environment, on human health and on many people, which we don’t often think about when we consume fashion,” Green said. This entry was posted in Manufacturing, Water and tagged College of Human Ecology, Cornell, Cornell Natural Dye Garden, dye, dyeing, dyes, eco-fashion, natural dye, sustainable dye, water pollution. Irene-Marie Seelig, Iciar Bravo Tomboly, Ana Pasalic, Agraj Jain, and Elise Comrie have plenty to wax triumphant about. On Monday evening, the five London College of Fashion students found themselves crowned the winners of the 2016 Kering Award for Sustainable Fashion, an annual competition born of a five-year partnership between the lifestyle and luxury conglomerate and the university’s Centre for Sustainable Fashion. Designed to inspire the next generation of ethical designers, the contest whittled 400 applicants to 10 finalists before determining who best fulfilled briefs for two of Kering’s subsidiary brands: Seelig, Tomboly, and Pasalic for Stella McCartney, along with Jain and Comrie for Brioni. Most of the applicants developed their projects by “rethinking the whole production cycle and value chain in fashion,” from material sourcing to end-of-life management. “This echoes Kering’s own commitment to drive luxury fashion toward higher levels of economic, environmental, ethical and social performance,” the spokesperson added. Meet—and hear from—the winners below. A Fashion Futures master’s student, Pasalic worked with researchers at the Massachusetts Institute of Technology to create a material with the smallest possible environmental footprint. By utilizing a “master batch” solution for dyeing, her “Uncoloured Colours” project could help cut back on water use while avoiding the human risk involved during the synthetic dyeing process. “Reflecting on my own work made me understand that if I want to change the fashion industry I have to do it right at the beginning, on a business level and on a personal level,” she said. “Albert Einstein once said ‘We can’t solve a problem by using the same kind of thinking as when we created it.’ Through the knowledge and the experience I gained during MA Fashion Futures I understood how I, as a designer, could influence and change the fashion industry, starting with materials. Tomboly, a postgraduate student specializing in fashion-design management, centered her project around measuring a company’s social impact based on the United Nations’ Sustainable Development Goals and Kering’s own code of conduct. Sustainability, she said, needs to take into account “all the human beings” involved in the supply chain and the impact our actions have on social values. Seelig first researched the holistic properties of mushrooms after her mother was diagnosed with lung cancer. While studying fashion entrepreneurship and innovation at the university, she developed a renewable, biodegradable, and vegan-friendly leather alternative using the skin of amadou mushrooms. After testing the material for durability and aesthetics—both prime considerations for viability in the luxury industry—the California native unveiled two shoe prototypes as part of her presentation. Comrie was inspired by her upbringing in Saskatchewan in Canada to develop a dye derived from tobacco, a fast-growing plant that takes only 90 days from seed to harvest. Working with Dimora Colours, which specializes in the development of nontoxic tobacco dyes and fibers, Comrie proposed a line of Brioni smoking jackets composed of the tobacco-dyed textiles. Jain, who is pursuing a degree in fashion design technology for menswear, drew upon his Jainism roots to present Ahimsa or “peace” silk as a cruelty-free alternative material for Brioni. Rather than boil the silk cocoon to prematurely release strands of filament-like fiber, Ahimsa silk is extracted only after a metamorphosing worm has emerged from its cocoon. This entry was posted in Uncategorized and tagged ahimsa silk, amadou mushrooms, Brioni, Centre for Sustainable Fashion, Dimora Colours, dyeing, Kering, Kering Award for Sustainable Fashion, Leather, London College of Fashion, MIT, Pasalic, SDG, Seelig, Silk, Stella McCartney, Students, Sustainable Development Goals, Tomboly, Uncoloured Colours, UnitedNation. Owners of dyeing units affiliated to 18 Common Effluent Treatment Plants (CETPs) in Tirupur knitwear cluster are looking forward for release of Rs. 200 crore from the Centre which they sought through the State Government as a grant to offset their debts. “Debts have arisen following the spending of Rs. 270 crore on research and development activities taken up over the last few years to improve the effluent treatment techniques and also to upgrade machinery, all with an aim to ensure we implement the zero liquid discharge (ZLD) norms stipulated by Madras High Court during the treatment of dyeing effluents,” said S. Nagarajan, president of Dyers Association of Tirupur. According to him, a sum of Rs. 270 crore was raised by the dyeing sector entrepreneurs through bank loans and other borrowings. The release of the grant was essential to replace some of the machines that had corroded over the years and to add more gadgets to ensure optimal utilisation of the installed capacity in the CETPs, he said. The dyeing unit owners pointed out that utilisation levels presently stood at below 75 per cent of the installed capacity at the CETPs. Meanwhile, a section of farmers, who had faced the brunt of industrial pollution that led to them move the court against the dyeing units, feels that the Supreme Court observation of ‘polluters pay’ in the ‘Dyeing unit owners versus Noyyal River Ayacutdars Association’ case should be respected. “The dyeing unit owners should themselves bear the cost for any R&D activities as they were the ‘polluters’ who damaged the ecology of River Noyyal. It is their responsibility to restore the ecology and ensure further compliance of ZLD norms,” opined P. Sankaranarayanan, a farmer. *This story first appeared on The Hindu. This entry was posted in Manufacturing, Water and tagged dyeing, India, Pollution Control, The Hindu, ZLD. Approach the massive Orathupalayam Dam by road, and it quickly becomes clear that something has gone terribly wrong. Within 2 miles of the dam, the lush rice paddies, coconut palms and banana trees that have characterized this part of southern India suddenly give way to a parched, bright red landscape, dotted only with scrub forest. The Noyyal River, which used to be clean and clear, now runs foamy and green, polluted with the toxic runoff of the titanic textile industry 20 miles to the west, in Tirupur. At first glance, Tirupur, aka “Knit City,” appears to be an exemplar of how globalization can improve the developing world. The garment industry here in the south Indian state of Tamil Nadu earns billions of dollars annually, employs about a half-million people and exports clothes to Europe and the United States. Chances are good that if you have a Gap, Tommy Hilfiger or Wal-Mart T-shirt marked “Made in India,” it came from here. American taxpayers have played a key role in turning Tirupur into a manufacturing powerhouse. In 2002, the United States Agency for International Development (USAID) loaned $25 million to the government of Tamil Nadu and a local clothing industry group, the Tirupur Exporters Association, to finance press release explained that before the American intervention, the local industry “was running out of water, a critical input for dyeing and bleaching.” As a side note, the release noted that the thousands of slum dwellers in the area could finally have access to treated, running water. The USAID project, which piped in clean water from a stretch of the Noyyal in a nearby farming region, helped the local industry boom. Between 2002 and 2012, U.S. knitwear imports from India jumped from $571 million to $1.25 billion, and an estimated 56 percent of those garments came from Tirupur. But all that growth has had devastating consequences for the environment and people living in the area. He walked me through Orathupalayam village, a small town at the base of the dam. Abandoned brick homes painted light blue and topped with red tile roofs dominated the main square. Plaques on the homes commemorated their erection—most date from the late 1980s, when construction of the dam began. Twenty-five years later, the Orathupalayam is one of over 60 villages that have been transformed into ghost towns. The dam was supposed to update agricultural irrigation practices in Tirupur. But by the mid-2000s, the water was so saturated with chemicals, salts and heavy metals that local farmers were petitioning the Madras High Court—the highest court in Tamil Nadu—to not release the water into their fields. It was making farmland unusable and locals sick. In 2002 and 2003, a local university set up 2007 study by a local nongovernmental organization found that Tirupur’s 729 dyeing units were flushing 23 million gallons per day of mostly untreated wastewater into the Noyyal River, the majority of which collected in the Orathupalayam Dam reservoir. When officials finally flushed the dam in the mid-2000s, 400 tons of dead fish were found at the bottom. A couple of weeks after I visited Tirupur, on April 24, 2013, Rana Plaza, an eight-floor complex of clothing factories in Dhaka, Bangladesh, caved in, revoked Bangladesh’s right to export certain clothing items to the U.S. without paying tariffs. Rana Plaza resonated with American consumers. After all, even Bangladeshi women earning less than two bucks a day deserved to go to work in the morning confident that they would be alive that evening. But while the disaster did force Westerners to take notice of the plight of those who make their clothes, a larger environmental crisis in the region continued unnoticed—despite impacting many hundreds of millions of people. According to Yixiu Wu, who helms Greenpeace’s “Detox My Fashion” campaign, the average pair of jeans requires 1,850 gallons of water to process; T-shirts require 715 gallons. And after going through the manufacturing process, all that water often ends up horribly polluted. The textile industry today is the second largest polluter of clean water after agriculture, and it has an outsized effect on the people of Asia. In large part, that’s because over the past two decades American clothing brands have steadily moved production out of the U.S. and into Asia. The American Apparel and Footwear Association estimates its members says. The benefit to the U.S. consumer is clear: Just drive to a nearby mall and pop into H&M, Uniqlo, Gap or any other fast-fashion label, and check the clothing tags. It’s likely that they’ll say the garments were made in Cambodia, Laos, Indonesia, China or Bangladesh—all countries competing to make a T-shirt that costs Americans and Europeans just $5 but takes a heavy toll on the people at its source. Near critically polluted waters like Bangladesh’s Mekong River, life-sustaining farms are dying, potable water has become toxic and locals are now at great risk for serious illness, all as a result of industrial-scale clothing manufacturing. At the core of this environmental and health disaster is the poor state of regulatory institutions throughout much of South and East Asia. Transparency International’s annual Corruption Perception Index paints a dispiriting picture: Cambodia and Burma (two of the latest hot spots for textile manufacturing) are tied with Zimbabwe at 156 out of 175 countries ranked, while Laos and Bangladesh are tied at 145. India fares a lot better at 86, but even there, human rights and environmental preservation are often trumped by the need to provide a business environment that can compete with more corrupt countries. In a 2013 study, Indian environmental scholar Geetanjoy Sahu investigated the country’s various state pollution control boards, responsible for regulating the environmental impact of all sorts of industries, including clothing manufacturing. Sahu, drawing on data gathered through Right to Information Act requests (similar to the U.S. Freedom of Information Act), found that the boards are often underfunded, understaffed and run by political appointees with no scientific background. The pollution control boards for two ocean-facing Indian states frequently cited as development models—Tamil Nadu and being investigated. In the wake of the Rana Plaza disaster, India’s clothing industry has presented itself as the sustainable, safer alternative to Bangladesh. On September 19, 2013, the Tirupur Exporters Association and the Indian Consulate in New York City co-hosted an event in Manhattan’s Garment District, a few blocks from the 34th Street fast-fashion strip. The event was designed to attract orders from American clothing brands, and the message was simple: Fiascos like Rana Plaza won’t happen in India. “The Indian apparel industry is compliance-oriented, and we follow all the rules of the game,” Arumugam Sakthivel, president of the association, told the Press Trust of India at the time. Sinnathamby Prithviraj isn’t buying it. The chubby, pompadoured and mustachioed social activist is one of the leading critics of the local clothing industry. He’s been fighting for years to publicize—and end—the industry’s polluting practices. In 2007, after a decade-long legal battle to shut down dyers who flagrantly violated pollution rules to supply major U.S. brands, Prithviraj and a group of farmers won a decision by the Supreme Court of India to shutter any dyers who hadn’t brought their liquid discharge down to zero. But India’s legal system moves slowly. The Dyers Association of Tirupur filed appeal after appeal, and the dyers continued to operate in the interim, despite being in contempt of the court’s decision. Meanwhile, as orders from major brands like Gap and Wal-Mart increased, so did the release of even more toxic wastewater. Then, in 2011, in what seemed like a triumph for the environmentalists, India’s Supreme Court told the utility company in Tamil Nadu to cut power to any dyeing factories in contempt of its order. Most of the factories could not afford to conform to the requirements and ended up shutting down. But this turned out to be a Pyrrhic victory for Prithviraj and his farmers. Wildcat dyers in outlying districts sprang up, and soon Tirupur’s garment pollution problem had spread statewide. In Namakkal, an adjacent district where inspectors are engaged in a game of whack-a-mole to shut down illegal dyers, M. Murugan, the pollution control board’s local environmental engineer, admits he’s fighting a losing battle. “Many units are small, mobile and can function without electricity,” he says. Over the past two years, the Namakkal pollution control board has averaged one or two raids per month. ” Ultimately, if we demolish [the dyeing industry] in Namakkal, in some other place it will come again,” he says. The next day, Prithviraj sent me out with his driver to see just how lawless the industry can be. For about an hour, my photographer and I snooped around a government-run industrial park home to a number of textile factories. But as I was gathering water samples from the river, the photographer strayed across a bridge to take pictures of a nearby factory, which he believed was illegally discharging waste into the ditch in front of the building. That’s when men began to approach us from several directions. I ran to the car to avoid a confrontation; the photographer seemed less concerned and kept snapping shots. I yelled for him to speed up and get back in our SUV, but he waved me off, strolling leisurely back to the vehicle. A large crowd gathered. A minute later, we were trapped. One of our pursuers, a brawny man in his early 30s with a shaved head and a clean, striped button-down shirt, blocked our car with his body. An older man joined him and produced a card saying he was from the TNPCB. Our driver, who had seen many such cards, immediately said it was a counterfeit. But the man with the shaved head took charge, warning us that we needed to “take the proper permissions to be here.” He introduced himself as “a local political leader.” We later found out that he was Jagadesh Np—one of the owners of Spencer Apparel, a dyeing company that makes clothes for an Indian department store chain, Westside. Lack of accountability means that it’s nearly impossible to figure out which companies were legally operating dyeing plants and which were not. In June 2013, I spoke numerous times on the phone with then-TNPCB Member Secretary S. Balaji, who was steadfastly evasive. In July 2013, H. Malleshappa replaced Balaji. Malleshappa also did not answer any phone messages from Newsweek. Late in 2013, a group of environmentalists forced out when a local crusading journalist revealed that Karthikeyan had been under investigation for corruption when he was appointed. Meanwhile, according to the the court dismissed Raagam’s case. Borja Castaneda, Desigual’s marketing director, says the company has been working with Raagam since 2012. “They have the temporary license to run the dyeing unit,” Castaneda wrote in an email to Newsweek. “This license has been annually renewed (including the one for 2015) as they are still pending to receive the final one.” However, Desigual was unable to provide documentation of the licensing. It was also unable to send over documentation of the audits it claims to undertake regularly. “Unfortunately, these are confidential,” said Castaneda. Raagam Exports was also unwilling to provide proof of its license to operate; its website has a “Compliance” section, but does not include any TNPCB licensing. And the TNPCB website provides nothing that can help to ascertain whether Raagam is currently licensed. Meanwhile, the company continues to send clothes to international brands—Desigual, for example, received its most recent shipment—almost 260 pounds of multihued viscose dresses—from Raagam in July 2015. P.N. Shamuhasundar runs Mastro Colours, a small hosiery dyer on Tirupur’s outskirts. The state government gave him and about 20 other dyers a $4 million, no-interest loan to overhaul and modernize their shared effluent treatment plant. Mastro is now certified as having “zero liquid discharge,” but the extra cost of treating and evaporating that liquid waste (instead of just dumping it into the river) means it can’t compete with polluting dyers. Shipping records provided by Datamyne, which tracks import-export transactions in the Americas, show that between 2007 and 2011, Wal-Mart’ s orders increased from Tirupur clothing companies who dyed garments in defiance of the court-ordered shutdown. Take Balu Exports, for example. 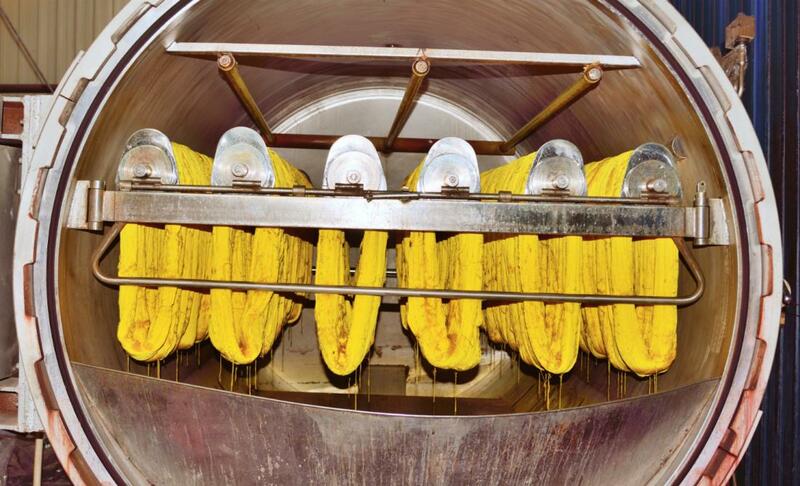 On its website, the company describes itself as a “vertical set-up under one roof.” Two of its divisions, Balu Process and Balu Exports Dyeing, are members of the Dyers Association of Tirupur. And since 2007, the association has operated in contempt of India’s Supreme Court order to reach zero discharge. Repeated inquiries to Wal-Mart over the years about its reliance on toxic dyeing companies have been unanswered. In 2015, after receiving detailed shipping records and documentation highlighting the illegal operating status of Balu and other companies from which Wal-Mart sources, Juan Andres Larenas Diaz, director of communications for international corporate affairs, sent a written statement to Newsweek: “Our expectation and a contractual requirement of doing business with us is that our suppliers and their subcontractors are in compliance with the law. Our relationship with garment suppliers in Tirupur has always been based on their ability to meet Wal-Mart’s supplier standards and code of conduct.” But Diaz would not address specific allegations. Prithviraj says he’s been similarly frustrated in attempts to engage Wal-Mart. Talking to Wal-Mart is like “banging your head against a wall,” he says. Instead, he suggested, we should try asking some “big brands”—like Gap, J.C. Penney, Tommy Hilfiger—about their record in Tirupur. Gap Inc. has long been on the radar of environmental activists. Every year, Greenpeace’s garment monitoring unit—called the Detox Catwalk—places major clothing companies in three categories: winners, greenwashers and losers. Gap Inc. is one of the most well-known “losers,” based on the company’s refusal to disclose hazardous chemicals and unwillingness to commit to stop using them. Over the past 15 years, Gap Inc. has increasingly outsourced its manufacturing. The company says it has a field team of 40 sustainability experts around the world who make both announced and unannounced visits to nearly all of the factories where its clothing is made. However, it also has come to rely on inspection from third-party firms in order to ensure its indirect suppliers—such as mills and dyers—are adhering to the company’s vendor code of conduct. In its 2012, that rose to over 50 percent. “If over 50 percent of their suppliers are not in compliance, then environmental issues are not a factor in the Gap’s supplier selection process,” says Heather White, a supply-chain expert and fellow at Harvard University’s Edmond J. Safra Center for Ethics . White adds that in many cases, factories end up paying auditors for an inspection report, and in those cases, “the quality of the findings suffers.” That’s because auditors are more likely to keep their jobs if the factories pass inspections. Bribery is common, White says—though she was not able to speak directly to activities within Gap’s supply chain. The issue, ultimately, is that the compliance measures taken by retailers like Gap, Desigual and the dozens of other firms sourcing garments in Tirupur don’t account for the complexity of modern clothing-supply chains. Fabric is frequently taken from a mill, dyed at a second facility (owned by the same parent company) and then sewn into finished garments at a third factory (ditto). A corporate auditor, examining the factory and the final product, would find it difficult to determine where the cloth has been dyed. Even visiting a dyeing facility isn’t enough; it’s easy for a given dyeing facility to subcontract some portion of its dyeing orders to smaller, unauthorized units. And it’s even unlikely that an inspector is present when effluent is treated—or released directly into the Noyyal, or dumped in a local field in the middle of the night. Auditing and even TNPCB approval, says Prithviraj, provide little more than a veneer of plausible deniability. “It’s a very sophisticated system of lying,” he says. A representative for J.C. Penney, for example, told Newsweek that “to the best of our knowledge it does not appear that J.C. Penney has any dyeing business in that area,” despite records showing that the company has been taking shipment for years from numerous vertically integrated manufacturers in the Tirupur area, including Eastman Exports. Eastman was operating in contempt of India’s Supreme Court 2007 demand that it reach zero effluent discharge during the time it sold garments to J.C. Penney. But since the American giant was able to buy from its “finishing” arms, it could feasibly deny knowledge of the illegal dyeing operations involved. “We confirmed with Eastman Exports that no dyeing services were performed for J.C. Penney’s private brand merchandise in those factories,” its representative wrote in an email. Eastman did not respond to requests for comment. Many of the other companies that rely on factories in South and East Asia offer similar promises. “Since we are operating in a water-intense industry, we have worked actively to reduce negative water impacts in different parts of the value chain for more than 10 years,” says Ulrika Isaksson, an H&M spokeswoman. “Our goal is to become the fashion industry’s leading water steward.” (H&M is one of supplier list, which includes both primary manufacturers and secondary suppliers like dyers.) Others, including Uniqlo and Tommy Hilfiger, did not respond to multiple requests for comment. Gap, for its part, has made a commitment to achieve zero liquid discharge in all its supplier factories by 2020. But even if it makes good on the promise, for many farmers in and around Tirupur, it’s likely to be too late. When I returned to Tirupur in January 2015, the Orathupalayam Dam was still filled with green, foamy water. The few locals who have remained in the area struggle to survive. Karuppaiah Subramanyam has lived and farmed near the dam for many years. From his house, I could see some scrub grass and a smattering of coconut trees, but when I looked a little more closely, the damage became clear: The coconuts—his only crop—were undersized, and many came off the tree already rotten. Subramanyam’s 7-acre farm, which was in his family for several generations, remains the same size it’s always been, but it has now become essentially worthless. When Tirupur’s clothing industry began producing more clothes and even more toxic runoff, he lost about half his crop, because his primary water source became unusable. “We can only do rain-fed agriculture now,” he explains. Before 1995, he could grow eggplant, green chilies, tomatoes, rice, turmeric and tobacco. Now he has to buy all that on the market, with the meager funds he gets from his remaining, undernourished coconuts. Asked whether he ever received compensation for his losses, he simply shakes his head. There were some court cases, but only the largest landholders with the best legal representation were compensated. Smaller farmers, like Subramanyam, got nothing. Prithviraj led 4,000 of these excluded farmers in an appeal to the Madras High Court, which ultimately decided they should all be remunerated by the dyers association for land that was made barren by the release of toxic textile runoff. Still, that’s only a fraction of the nearly 30,000 farmers Prithviraj estimates lost their livelihood. Meanwhile, illegal dyeing units continue to surface regularly. 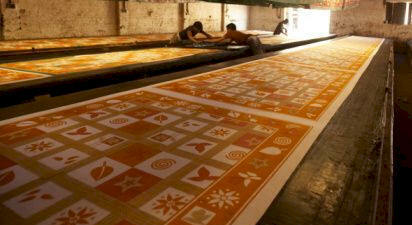 “Some of the new dyeing factories are coming up in other river basins and even in the coastal areas,” says Prithviraj. He mentions Cuddalore, an ancient seaport town about 200 miles east, where chemical pollution in some areas has already raised the risk that residents will contract cancer in their lifetimes at least 2,000 times that of the average person. Additional reporting by Aletta Andre and Anil Varghese. **This story originally appeared here. This entry was posted in Manufacturing and tagged dyeing, India. The industry is increasingly cleaning up chemicals at the beginning of the supply chain, including in textile dyes and on the factory floor. High-pressure cotton dyeing equipment is shown above. Since 2013, Greenpeace’s “Detox” campaign against apparel companies successfully has catalyzed new approaches to eliminate hazardous chemicals from products and supply chains. It’s not just activist pressure, but also the desire within the industry to do good, that is driving the reduction of hazards in everything from children’s clothing to sportswear. Efforts to reduce hazardous chemicals and environmental pollution in the manufacturing supply chain include the Sustainable Apparel Coalition’s Higg Index, the Outdoor Industry Association’s Chemicals Management Module and the Zero Discharge of Hazardous Chemicals’ Roadmap to Zero. Traditionally, such efforts have centered around Restricted Substance Lists, which have been used in the textile industry since the late 1990s. They contain restricted chemicals that are usually, but not always regulated. These chemicals can be used in manufacturing and be present in consumer products, as long as the amount is not greater than the allowable limit. 1. Establish the allowable limit in the product. 2. Train and educate manufacturers to implement the RSL. 3. Verify through product testing. Because restricted chemicals may be used in manufacturing, there is always the possibility that hazardous chemicals may end up in discharge water. Today, however, a sea change is placing greater emphasis on managing input chemistry rather than treating effluent. Hazardous chemicals are eliminated at the beginning of the supply chain before they enter the manufacturing facility. This prevents the need to clean up waste water and toxic pollution. Some tools, such as bluesign, have been available for several years, while others are just being introduced, and some chemical companies are seizing the opportunity to lead in the marketplace. The bluesign system is a standard for environmental health and safety in the manufacture of textiles. It was developed in Switzerland 15 years ago and is gaining momentum with chemical suppliers, manufacturers and brands. Bluesign works with chemical suppliers to ensure their formulations meet strict requirements. Production sites are audited and a set of guidelines must be met prior to a chemical supplier selling “bluesign certified” formulations. Approved bluesign partners regularly report their continuous improvement and progress in energy, water and chemical usage, and are subject to on-site audits. Many large global chemical suppliers including Huntsman, Archroma, CHT and Dyestar are bluesign partners and produce bluesign-compliant formulations. Bluesign chemicals are available for all stages of textile production, from spinning to garment manufacturing. This enables brands and manufacturing facilities to make smarter and safer choices. The bluesign system helps factories manage “gray” chemicals and replace “black” chemicals with safer alternatives. An MRSL differs from a Restricted Substance List (RSL) because it restricts hazardous substances potentially used and discharged into the environment during manufacturing, not just those substances that could be present in finished products. The MRSL addresses any chemical used within the four walls of a manufacturing plant, including those used to make products and clean equipment and facilities. The Zero Discharge of Hazardous Chemicals group developed and published an MRSL with input from key stakeholders including brands and chemical companies. ZDHC developed one MRSL for the apparel industry. This benefits brands, manufacturers and chemical companies because they only have to adhere to a single set of criteria with the same chemical restrictions, limits and test methods. Chemical companies are in the process of developing a list of MRSL-compliant formulations that adhere to the strict limits placed on a given chemical formulation rather than the finished product. CHEM-IQ is a chemical management tool released by the VF Corporation. Developed in collaboration with third-party experts, including the Natural Resources Defense Council, CHEM-IQ provides a proactive, cost-effective method for identifying and eliminating potentially harmful chemicals before they enter manufacturing. Samples from chemical formulations are tested in a lab for the presence of about 400 hazardous chemicals. If any are present above a certain limit, VF works with its supply chain to determine an action plan to move towards safer alternatives. In addition to the tools and certification systems described above, two small textile chemical formulators, Garmon Chemicals and Beyond Surface Technologies, are also adopting a “front of the pipe” approach. Innovative Italian chemical company Garmon Chemicals has taken an interesting approach in how it assesses, manages and chooses chemical ingredients in its formulations. It recently announced a partnership with Turkish mill Orta denim and Clean Production Action’s GreenScreen for Safer Chemicals. Garmon incorporates GreenScreens into its raw materials assessment. GreenScreen chemical assessments are based on the hazard profile of a chemical rather than the risk profile. All intentionally added ingredients are screened and assigned a GreenScreen score. Chemicals scored as “Benchmark 1” (to avoid as a chemical of high concern) are not accepted in any formulation. This approach helps Garmon prioritize efforts to find safer alternatives. The company has developed a range of specialty chemicals called “environmentally conscious chemistry” using GreenScreen as an inspiration for innovation. 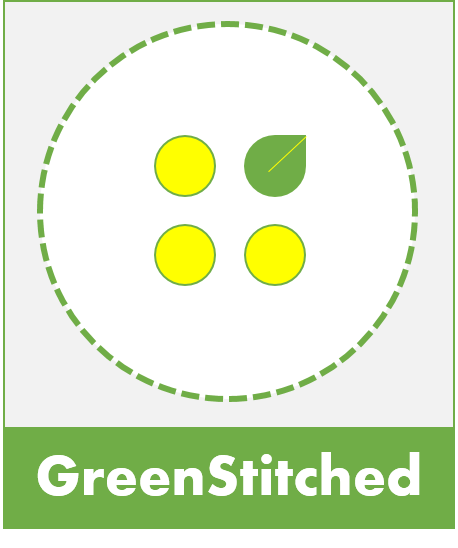 Garmon has positioned GreenScreen as a platform to develop products for the eco-conscious consumer who demands transparency. Particularly impressive, Garmon has eliminated potassium permanganate and sodium hypochlorite, two cheap commodity chemicals used to bleach indigo denim. It replaced them with their Avol Oxy White, which provides a similar visual effect. 1. Establish long-term partnerships across industries and co-create new capabilities. 2. Drive science and design, with the goal of developing new aesthetics. 3. Trigger healthy changes throughout the manufacturing supply chain that injects “premium” and “sustainable” and “quality” and “integrity” as operational guiding principles in the garment industry. BST, a small and innovative chemical company, has a different approach to assessing its raw materials. It selects raw materials with either the highest possible content of bio-based carbon (PDF) or materials approved for use in the personal care or food industry, so that it does not need to worry about contaminants and impurities. If it is safe enough to eat or put on your skin, it is safe enough to be used in apparel. Patagonia is so impressed, it recently invested in BST through its 20 Million and Change Fund to help BST expand to other functional finishes for textiles, such as water repellency. As these examples indicate, the textile industry is making progress in reducing environmental pollution in the textile supply chain by focusing on the management of input chemistry. Stronger partnerships among brands, manufacturers and chemicals companies; a more rigorous approach towards the elimination of hazardous chemicals; and innovating to find safer alternatives to chemicals of concern are moving the needle towards safer consumer products within cleaner supply chains. ** This article first appeared on GreenBiz.com here. This entry was posted in Chemicals, Manufacturing and tagged 20 Million and Change Fund, apparel, bluesign, BST, CHEM-IQ, Chemicals Management Module, dyeing, garmenting, Garmon Chemicals, Green Chemistry, Greenpeace Detox, Greenscreen, Higg Index, knitting, MRSL, Natural Resources Defence Council, Patagonia, RSL, spinning, Suppy Chain, Sustainable Apparel Coalition, Sustainable Chemistry, VF Corporation, weaving, ZDHC. JODHPUR: The National Green Tribunal’s (NGT) circuit bench of Jodhpur has ordered the closure of 739 textile units in Balotra and its surrounding areas of Jasol and Bithuja till July 9. It has also ordered the trust operating the Common Effluent Treatment Plant (CETP) to renew the Consent to Operate the plant and obtain the hazardous waste disposal authorization from the Rajasthan State Pollution Control Board. The orders by the tribunal comprising judicial member UD Salve and expert member DK Agarwal followed a joint CETP inspection report by the Central Pollution Control Board and Rajasthan Pollution Control Board submitted in the court on Friday in pursuance of the order by the tribunal on March 19. The report said that the CETP has not been functioning in adherence to the norms laid by the pollution control boards as far as the Consent to Operate and disposal of hazardous waste of the industries is concerned. The joint report has also recommended installing adequate capacity RO plants immediately with a view to reuse the treated water in the member units and procure land for the evaporation of RO rejects. A report had been submitted to the Central government by the CETP trust but the trust has not received sanction for the same. Keeping this in mind, the tribunal has also directed the MoEF to expedite the process so that the CETP trust could install the plant sooner. Besides the tribunal has also directed the “Prabodhan Samiti”, chaired by the district collector to regularly monitor the CETP and address shortcomings with regard to its operation and compliance of the rules. The tribunal has also sought an affidavit from the district collector to the effect that the water being used by these industries is not being drawn from the areas notified as Dark Zones. A similar report on the sources of water to the textile industries in Jodhpur and Pali has also been sought by the tribunal on Thursday. This report is to be submitted on July 9. Besides, the tribunal has also ordered closure of those units in Pali, which have been operating without renewal of Consent to Operate from the Pollution Control Board. **This post first appeared in Times of India here. This entry was posted in Chemicals, Manufacturing and tagged dyeing, Effluent Discharge, India, National Green Tribunal, Pollution, Times of India.